My professors worry that I'm sliding down a slippery slope, but I know I'm still on the path of redemption. I've worked too hard for too long, and I have no intention of letting down my family. When Bryn disappears during a routine field trip, though, I must put my need to succeed on hold. After all, what good is being the best if I can't use my powers to help those closest to me? The more facts I uncover, the more I realize that her disappearance is part of a much larger scheme--one that threatens our very existence. Can I stop a diabolical plan in motion or will I suffer the same fate as those I'm striving to save? 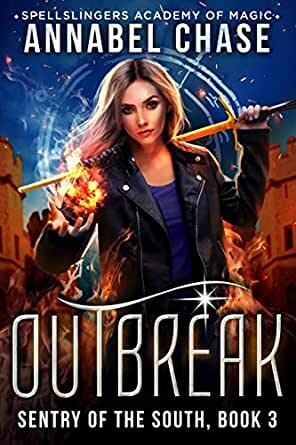 Outbreak: Spellslingers Academy of Magic, Sentry of the South (Book 3) is an urban fantasy mystery with humor, action and adventure, a powerful heroine, and a charming yet unlikely hero. I love Bryn , Dani , Mia , Cerys . The guys Peter , Gray , Robin. Dani and Bryn work together to save the paranormals that were trapped. With the help of the guys , teachers they got the mystery solved. This series is entertaining, as always. There's adventure, magic, romance and obstacles that are overcome. I love this series and I'm sure you will also. 5.0 out of 5 starsGreat ending to this series. Bryn is gone and they need to find her, then it gets complicated, and rowdy and dangerous. Great story, greater characters and fun ending. So glad this series was so good to read. I really like the way these characters are developed and how we can become enamored with their personalities and their powers. Lots of unique paranormals in this one. 5.0 out of 5 starsWhat a great series! 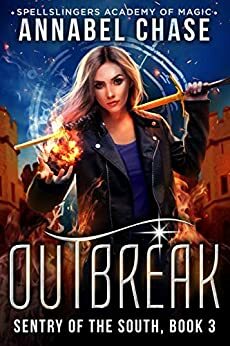 As the final book in Sentry of the South trilogy, this offered both a stand alone story and a satisfying conclusion to Dani's individual arc. I've loved the way each character is well rounded and has realistic flaws and limitations that help avoid falling into the Mary Sue trap. I can't wait for the next set of stories, I'm not sure if I want it to be Mia or Cerys but either way I'm ready.